If you’re someone who doesn’t want to skimp on accessories, does want 24/7 monitoring by a third-party security company, and the cost of the whole thing is something you aren’t overly concerned about, then Alarm.com just may be what you’re looking for. The Alarm.com system uses wireless cellular technology to communicate your home’s status to third-party security teams. This ensures that even if an intruder cuts communication lines going into your home, your system is still up and running wirelessly. This alone is a great feature of Alarm.com. The entire system has a battery backup should the power go out. So, for up to 24 hours after a power interruption, your family and home are still safe. Alarm.com’s Image Sensor not only alerts you when motion is detected in a certain area of the home, but it also takes a high-quality picture and allows you to view it on your smart device or on your personalized Alarm.com website. You can tie your home security and home automation together in ways others can’t do. One example from Alarm.com’s website states that you can configure your system to shut down your HVAC in the event that carbon monoxide or smoke is detected, helping to slow down their spread throughout the home. You have full control over your Alarm.com system through the Internet using your smartphone, tablet, or computer. 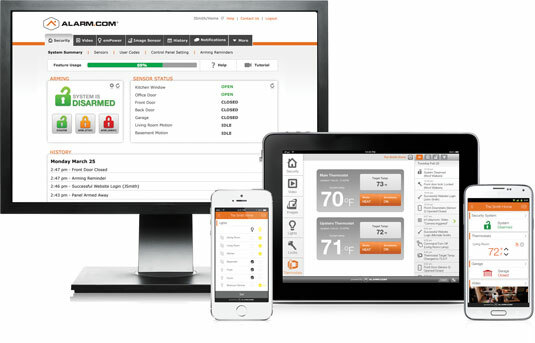 Alarm.com is a full-service security and home automation outfit; it can do it all, and it also gives you full control over your security solution through its apps and website. You owe it to yourself to at least give this company and its products a look. Alarm.com does more than home security; it also is quite fluent in the languages of home automation, energy management, personal wellness, and more.